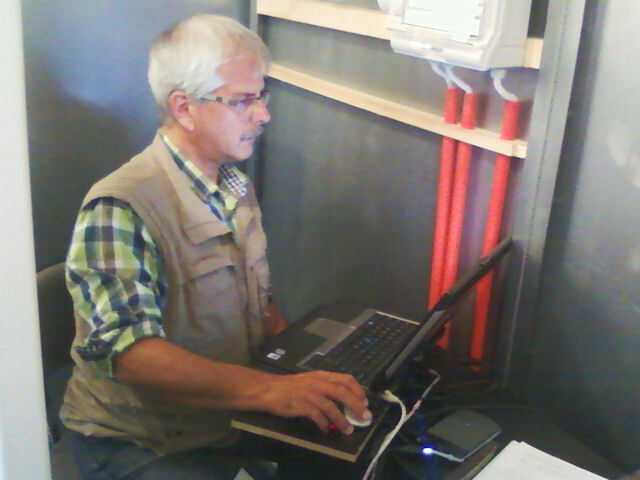 In parallel to the work on the tiles, it is also necessary to set up the computing and networks. This was done by Klaas Stuurwold from ASTRON. Klaas spent the entire time working in this spot behind the equipment racks. Here's a photograph of him in action. At least he has changed his shirt, but the vest remains the same. ;) I must admit that I’m a tad sad about missing out KAIRA almost completely this summer. Luckily this blog exists! Yes, it is a pity you couldn't be up here more, Arttu. We could certainly use your help... especially on the cabling work!